Pictured above is Major (Acting) Duncan McIntyre Wilson (known as DM) of the Royal Artillery who was the Officer Commanding of the Torry Battery during the latter part of World War Two. 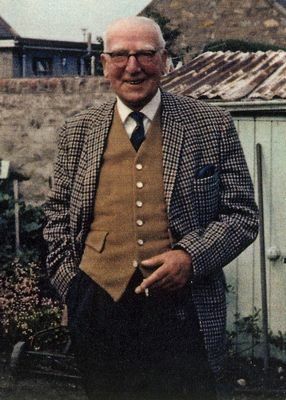 He was born at 61 Cross Street, Fraserburgh on 13 January 1898 but settled in Aberdeen where he owned a fish merchants "underneath the arches" below the railway line into the joint station. He lived in Brimond Place in Torry in the 1930s before moving over to Holburn Street in the 1940s. He had seven brothers and sisters and it is thought that the family were involved in the herring business in Fraserburgh until problems in the early 1920's when the shoals disappeared and caused extreme hardship in the area at that time. He became a fishmonger in Leeds and got married down there in 1926 to Elizabeth Robertson, who was also from our Granite City, but they moved back to Aberdeen in 1927 and got a house in the "Garden City" - Brimond Place. Duncan was also a veteran of the Great War in which he served as a Second Lieutenant in the Gordon Highlanders. His grandson, Alastair Ross, thinks that 2nd Lt Wilson was attached to the Warwick Regiment and posted to Mesopotamia (modern day Iraq) from 1917 to 1919. He was engaged in battlefield clearance (body removal), an experience which haunted him for the rest of his life. For some reason, his medal record from the First World War shows that he was declined a medal but the photocopy his grandson received when researching his family history is really too vague to make out. 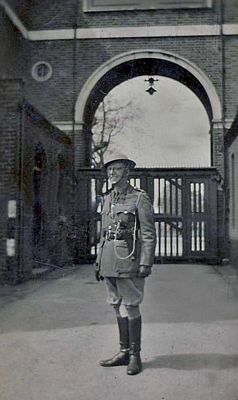 Duncan Wilson joined the Home Guard in Aberdeen during the Second World War but was subsequently re-commissioned into the Army and posted to London during the Blitz - he was stationed at Woolwich Arsenal, where the first above photo was taken by the Barracks, and then posted back to Aberdeen as OC of the Torry Battery. I remember him with great affection but he died on 14 September 1970 in Aberdeen when I was only nine years old. As children we always had to be very careful around him and not make loud noises as that gave him throwbacks to the war (I'm guessing he had what was known then as "shell shock" now known as Post Traumatic Stress Disorder). I know he had the fish merchants business under the arches but I struggle to remember the number (possibly 7) which he sold to one of his fish wives when he retired in the late 50's / early 60's. Mike, another of his grandchildren, remembers his father, Duncan R Wilson who was 12 years old at the time, being taken with his father (DM Wilson) when he enlisted in the Home Guard when it was started in Aberdeen. He thinks registration took place at the Gordon Barracks near the Bridge of Don. He was married to Elizabeth Robertson who was a special needs school teacher at Kittybrewster before retiring in the 1960's. She taught in London in Bethnal Green during World War One and had stories of seeing the Zeppelins on their bombing runs. He had a long association with the Boys� Brigade and volunteered with the 1st Fraserburgh Boys� Brigade from 1920 to 1924. His father, James Wilson, is regarded as the man who brought the Boys' Brigade to Fraserburgh. He had been Captain of the 13th Aberdeen from 1901 until 1920 when they moved back to Fraserburgh. The 1st Fraserburgh was formed in 1920, registered in 1921, and is still going strong. Another brother, Jack, was also involved with the 1st Fraserburgh BBs. They had three children (Duncan R Wilson and twins: Joyce and June) who are all still alive though in their eighties. Duncan R Wilson's son Mike lives in Aberdeen and is a keen historian of Aberdeen Silversmiths while his daughter Julia lives out at Ennochie, near Banchory. June and Joyce live in Currie, just outside Edinburgh near to their own families and remarkably only a couple of doors away from each other! Both have many wartime memories of Aberdeen and are immensely proud of their father and the roles that he played during both conflicts. Alastair would love to hear from anyone needing further information about his Grandfather and his military career, or indeed if anyone has information about him. Please contact us and we shall pass on information.